Is Keurig Coffee Just Like Pour Over Coffee? There’s nothing wrong in trying out different kinds of coffee brews. After all, it’s a learning experience in itself. And there’s always the chance you’ll be surprised with the latest innovations in coffee brewing. Let’s look at two popular coffee brews: Keurig coffee and pour over coffee. My first encounter with a Keurig coffee, commonly known as K-cup, was during a business meeting I attended about three years ago. It was so fancy at the time that most of us ended lining up for a taste of K-cup. The percolator at the end of the buffet table sat quietly and patiently. When the line over at the K-cup grew long, some of the guests got impatient and went over to the traditional brewed coffee. I think they also went to try the K-cup when the line was shorter. Now that I look back to that time, it would have been interesting to ask them about the difference between K-cup and traditional brewed coffee. I have yet to try to pour over coffee and I’ve heard it’s super fancy, as if you are a coffee scientist of some sort. It mus be cool to watch a pour over coffee brewing in action. 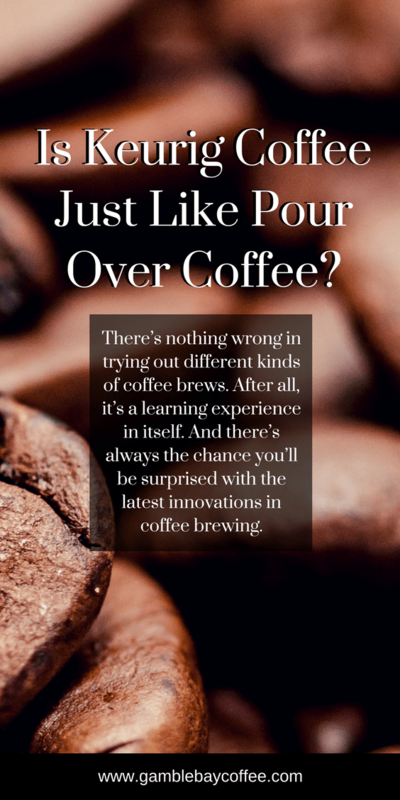 But, I only have my own experience to tell plus a few types of research to identify the similarities and differences between Keurig coffee and pour over coffee. Keurig has become very popular with many audiences despite its pricey nature. Keurig coffee is mass produced and can be stored in a warehouse for almost 24 months until consumed. However, this long shelf life can also affect the taste of coffee. Still, Keurig is very popular, given its convenience. Drinking Keurig coffee is almost like you are drinking instant brewed coffee, although it is not instant coffee, per se. You see, instant coffee is scooping powdered coffee into a cup of hot water. On the other hand, with a K-cup (the little sealed cup/popular term for Keurig coffee), the machine, or pod, forces hot water through the K-cup and you get a nice cup of brewed coffee in less than two minutes. This is confusing for many, but just remember this: instant coffee uses powdered coffee, while K-cup quickly brews coffee using grounds inside little sealed pods or capsules. Big coffee brands offer their own K-cups. Starbucks, Green Mountain, Dunkin’ Donuts, Tully’s, and Nescafe have patented Keurig coffee pods. The promise is that you will be able to bring home the taste of your favorite coffee brands and enjoy a cup at the comfort of your own home. an airtight seal that seals in coffee ground freshness. When you hit the brew button on your Keurig coffee maker, the machine forces hot water through the K-Cup at the optimal pressure and temperature. That’s how you get a cup of fresh coffee, instantly. However, many people are discouraged from owning a Keurig. And those who already own one realize that they are spending more on their K-cups than with traditional brewed coffee. In an article by the Washington Post, a comparison of K-cups and ground coffee was created to see how much it would cost to use K-cups versus ordinary coffee maker. One fairly typical analysis, comparing Caribou brand K-Cups versus ground coffee, showed that the per-cup cost was 66¢ versus 28¢, respectively. If you make three cups a day, 365 days a year, that adds up to around $723 spent on K-Cups, versus $307 for regular coffee brewers. So you’d easily save $400 a year by going the old-fashioned route. Just like any other kind of brew, K-cup has its pros and cons. If you ask your grandparents, the K-cup is very futuristic. It’s something they would have dreamed of during the days when they used coffee pots to brew coffee. But once they taste the coffee produced by a K-cup, they might as well stick to their old-fashioned brewing method. Pour over is the stuff baristas are made of. And if you are planning to show off your barista-like skills to your friends or your date, then using a pour over is your guaranteed ticket to success. Some of the most popular pour overs are Chemex and Hario V60. The equipment for these looks very fancy and impressive. Using a pour over can be intimidating at first. However, it promises to yield a smooth cup of coffee due to its temperature control and gentle process of pouring hot water over freshly ground coffee. Produces a really magnificent cup of coffee that allows flavors in the beans to speak for themselves, so no need for any add-ins. It’s fun to experiment and taste the difference between varieties of coffee. Good luck noticing those subtleties with your parents’ hand-me-down drip machine. The bonded filter catches sediment and oils, preventing bitterness. You can brew more than one cup at a time. For better coffee taste, use coffee grounds with the coarseness of table salt. Also, use a gooseneck kettle to have the best control when pouring water over the coffee ground. You don’t want to over-pour on the coffee ground. Let the water flow gradually and see how it seeps through the coffee ground, extracting the natural flavor of coffee beans. This process could take 5 minutes, but the resulting cup of coffee has a smooth and creamy taste. Again, coffee brews are always matter of choice. However, if you prefer convenience, like getting a cup of coffee with just one push of a button, then the Keurig coffee is perfect for you. Get a pod machine for your home use and enjoy “instant” brewed coffee in just a matter of minutes. Just remember that some of the pods could have been months or close to 2 years old. Try to check manufacturing or expiration dates and make sure you are getting a fresh batch of pods every week. Keep in mind the price, too. Keurig coffee can easily give you a household expense of $700 – $1000 yearly, just for a daily cup of coffee. Now, if you love experimenting with coffee brews, pour over coffee will be your best friend. It’s a good piece of equipment to own if you want coffee appreciation moments with your friends. However, it’s not something you can use every day before work. Unless you like getting up early, you will be late for sure. Preparing and cleaning up the equipment will take several minutes. It’s not exactly a convenient type of coffee brew. But the taste is really remarkable. So, if you fancy a rich and flavorful cup of joe, set a time and use your pour over coffee machine. ← Why Would You Put Eggshells in Coffee?